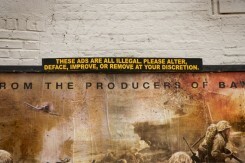 A little over a week ago PublicAdCampaign and The Heavy Projects launched the AR I AD Takeover in Times Square, NY. The Augmented Reality Junaio channel used 5 separate ad campaigns to trigger their own replacement with the artwork of 5 of their favorite public space artists including, Ron English, John Fekner, PosterBoy, OX, and Dr. D.
After challenging outdoor advertising’s supremacy in public space for the past 10 years by illegally re-appropriating physical advertising venues, PublicAdCampaign has raised awareness but -according to Jordan Seiler- made little progress in their ultimate goal of completely removing outdoor signage from our shared environment. With the advent of Augmented Reality the rules are beginning to change as to who can claim ownership to public space and we are excited to be on the cutting edge of this new adventure to redefine the visual landscape of our shared public environment. Though we prefer a redefinition of reality over the redefinition of an augmented or projected one. Augmented Reality Advertising Takeover (AR | AD) from The Heavy Projects on Vimeo. “While augmented reality is still in its infancy, it will not be long before AR becomes an integral part of our daily lives and augmentation becomes a common occurrence as we navigate the real world. Typical uses of AR today, such as information overlay and navigation tools, will give way to physical alterations that will forever change how we perceive the world around us. Most notably for PublicAdCampaign our visual environment will give way to endless editability. “It is not far fetched to imagine simple AR based visual alterations such as the font on road signage, the number of trees on your block, or the way artistic and commercial imagery are represented in our shared public space. While these changes will alter society in profound ways, their outcome is not predetermined and will no doubt be highly legislated as we cope with the increasing benefits and detriments of a user defined hyper-real world. “Questions of what one can and cannot legally change about the real world will arise as it would be unwise for motorists to receive road signs in an unreadable font. With obvious restrictions needed, the virtual world will quickly become a semi defined space as our public environment exists today. And yet it will be these definitions, or lack thereof that will allow this new technology to usher in an age of democratic public space usage unheard of in our time. In light of this, the advertising industry is already talking about how augmented reality will alter power dynamics in public space and forever change the supremacy of private property and the conveyance of private commercial interests in public space. No doubt this industry will do its best to continue to control our visual public environment in an augmented future.